As we’re in France lets make a classic French dessert, or is it from Cambridge…hmm that’s for another day. This method doesn’t call for messing around with water baths, instead it’s just cooked low and slow in the oven. First off, preheat the oven to 100°c standard (no fan assistance). Combine all the ingredients in a saucepan, whisk well and then gently heat, stirring constantly, paying particular attention to the bottom of the pan as this is where the heat is strongest. Do this until the sugar has dissolved and the mixture is more than warm. This is better than putting a cold mix into the oven, think about it, if the oven has to heat up the ramekins and then the crème brulée mix it is going to take longer to cook and do so less evenly. Next place 6 raspberries in each ramekin with the hollow side down and fill them almost to the top. Cook in the oven for around 1hr, when done they should look shiny and wobble like a panna cotta. Take out of the oven and leave to cool before chilling in the fridge for at least 2hrs. Dice the cucumber and place in a bowl with the raspberries, pretty easy huh? About half an hour before you want to serve the crème brulée pour some St Germain Elderflower Liqueur, a squeeze of lemon and a tsp of icing sugar over the raspberry cucumber mix, gently stir and leave to macerate. Place an even layer of sugar over the crème brulée and caramelise with a blow torch taking care not to burn the sugar too much, the sugar needs to burn a little otherwise it’s not a true crème brulée! 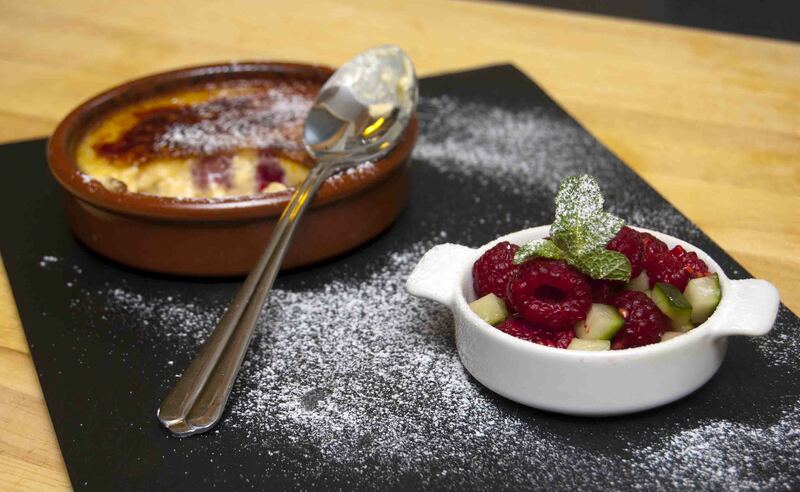 Place the raspberry and cucumber in your chosen serving dish to accompany the brulée, garnish with mint and a dusting of icing sugar then present it to your lucky diners! After tasting this I can honestly say with no ego that this is the best crème brulée I have ever eaten, super silky texture! A little bonus note to the dish was very subtle to some, but it blew me away, this was simply that the raspberries were packaged in a duo-pack along-side fresh blueberries. Some how the raspberries absorbed the fragrant floral notes from the blueberries and this added a whole new dimension to them, blueberry at the start mellowing out into a very nice sharper raspberry taste at the finish. Excellent! 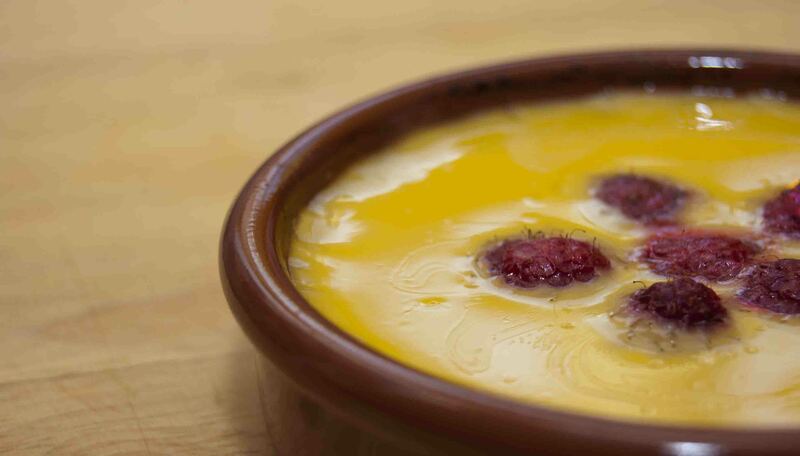 This entry was posted in dessert, Food, Fruit, Photography, Recipe, sweet, Uncategorized and tagged cream, creme brulee, custard, dessert, French, milk, Nikon D50, photography, raspberries, raspberry, summer, sweet, vanilla by tomcosserat. Bookmark the permalink.